Many media accounts simply repeat uncritically the rather dubious accusations of the administration. There are multiple reasons why substantial skepticism is warranted concerning the Bush administration's claims that the structure which Israeli jets destroyed inside Syria last September was a nuclear reactor Syria was developing with the aid of North Korea. Such skepticism, however, is difficult to find in most (though not all) American press accounts, which do little other than repeat Government claims without challenge. The White House said Thursday that North Korea did secret work on a nuclear reactor with Syria . . . Seven months after Israel bombed the site, the White House broke its silence and said North Korea assisted Syria in a secret nuclear program. . . . While calling North Korea's nuclear assistance to Syria a "dangerous manifestation" of Pyongyang's nuclear weapons program and its proliferation activities, the White House said. . . . The United States became aware North Korea was helping Syria with a nuclear project in 2003, said intelligence officials who spoke on condition of anonymity because of the matter's sensitivity . . . The critical intelligence that cemented that conclusion, they said, came last year: dozens of photographs taken from ground level over a period of time, showing the construction both inside and outside the building. . . . The Israeli strike on Sept. 6, 2007, ripped open the structure and revealed even more evidence to spy satellites: reinforced concrete walls that echoed the design of the Yongbyon reactor. . . . The alleged Syrian nuclear reactor was within weeks or months of being functional, a top U.S. official told The Associated Press, speaking on condition of anonymity because of the sensitivity of the matter. . . . But the U.S. official said the reactor was similar in design to a North Korean reactor at Yongbyon, which has produced small amounts of plutonium, the material needed to make powerful nuclear weapons. . . . The White House also used its statement as an opportunity to denounce the nuclear activities of Iran, which it says is a threat to the stability of the Middle East. While US and Israeli intelligence suggests Syria was close to completing the physical reactor, they have no evidence that Syria had obtained plutonium to feed into the reactor. 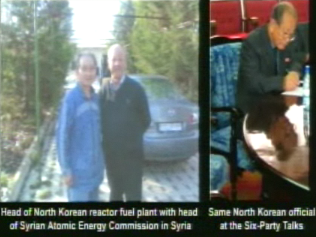 "The US does not have any indication of how Syria would fuel this reactor, and no information that North Korea had already, or intended, to provide the reactor's fuel," said David Albright, a nuclear expert at the The Institute for Science and International Security. Beyond the lack of evidence supporting the Israeli and American claims that "Syria was close to completing the physical reactor," there are multiple other reasons for skepticism. This article by David Sanger in The New York Times references several of them, including the fact that "senior intelligence officials acknowledged that the evidence had left them with no more than 'low confidence' that Syria was preparing to build a nuclear weapon" and some of the photographs in the video presentation 'seemed to go back to before 2002.'" Secretary Powell's recent presentation at the UN showed the extent to which we have Iraq under an audio and visual microscope. Given that, I was impressed not by the vastness of evidence presented by the Secretary, but rather by its sketchiness. Beyond all of this, there are all sorts of motives for the administration to exaggerate or outright fabricate these accusations. There have long been, and still are, influential neoconservative factions eager for confrontation with Syria. Similar factions want to derail talks with North Korea. And the administration's reflexive support for anything Israel does -- particularly when it comes to acts of military aggression -- along with its possible approval of or even active support for the air strike, provide obvious incentive to justify the destruction of this building. That the administration is voicing these accusations is, of course, news, and the accusations ought to be reported. And even though it seems unlikely for numerous reasons, it's at least theoretically possible that the Syrians are attempting to develop a nuclear reactor for non-civilian purposes with the help of a cash-strapped North Korea. But there is no value -- and much potential harm -- in having media outlets simply amplify Government accusations with little or no critical scrutiny. Worse still -- though completely unsurprising -- is the almost complete lack of challenge to the underlying premises. We just accept uncritically the idea that it is the expression of Ultimate Evil for Syria (or Iran) even to pursue nuclear power in accordance with their obligations under the NPT, let alone develop a nuclear weapon, even while Israel stockpiles enormous amounts of nuclear weapons and refuses to be a party to that treaty. Virtually nobody questions the right of Israel simply to attack its neighbors whenever it wants (imagine the reaction if Syria or Iran had unilaterally bombed a facility inside Israel which it claimed was used to develop destructive weapons). And all of that is underscored by recent claims by the Israeli Government that President Bush himself expressly approved of Israeli plans to expand settlement activities in the West Bank at a time when he was pretending to support a halt to that expansion. As the recent Democratic debate conclusively proved -- in which both candidates (Clinton far more extensively than Obama) vowed that the U.S. would consider an attack on Israel to be an attack on the U.S. -- our extremely consequential policy of reflexive support for Israel, no matter what it does, remains the least debatable issue in American political life. But even within those restrictive parameters, extreme skepticism is obviously warranted when the U.S., in defense of Israeli military action, begins making rather extraordinary and potentially quite provocative accusations against one of Israel's prime Middle Eastern enemies. UPDATE: As Jim White notes, the IAEA is condemning both Israel and the U.S. -- Israel for the unilateral attack on Syria without even asking the IAEA to inspect the facility (an inspection Syria would have been required by the NPT to allow), and the U.S. for withholding from the IAEA its claimed evidence of Syrian nuclear activities. But as is well known, international obligations of that sort are just like the word "Terrorism" -- they don't apply to the U.S. or Israel. They're only to be cited when it comes time to "justify" military action by those two countries against others. In mid-1998, American reconnaissance satellites photographed imagery of a major underground construction project at Kumchang-ri, twenty-five miles northwest of Yongbyon. "We were briefed that, without a doubt, this was a nuclear-related facility, and there was signals intelligence linking the construction brigade at Kumchang-ri to the nuclear complex at Yongbyon," the former State Department intelligence expert recalled. Charles Kartman, who was President Bill Clinton’s special envoy for peace talks with Korea, told me that the intelligence was considered a slam dunk by analysts in the Defense Intelligence Agency, even though other agencies disagreed. "We had a debate going on inside the community, but the D.I.A. unilaterally took it to Capitol Hill," Kartman said, forcing the issue and leading to a front-page Times story. After months of negotiations, Kartman recalled, the North Koreans agreed, under diplomatic pressure, to grant access to Kumchang-ri. In return, they received aid, including assistance with a new potato-production program. Inspectors found little besides a series of empty tunnels. Robert Carlin, an expert on North Korea who retired in 2005 after serving more than thirty years with the C.I.A. and the State Department's intelligence bureau, told me that the Kumchang-ri incident highlighted "an endemic weakness" in the American intelligence community. "People think they know the ending and then they go back and find the evidence that fits their story," he said. "And then you get groupthink -- and people reinforce each other." "The silence from all parties has been deafening," David Ignatius wrote in the Washington Post, "but the message to Iran" -- which the Administration had long suspected of pursuing a nuclear weapon -- "is clear: America and Israel can identify nuclear targets and penetrate air defenses to destroy them" . . . . Shortly after the bombing, a Chinese envoy and one of the Bush Administration's senior national-security officials met in Washington. The Chinese envoy had just returned from a visit to Tehran, a person familiar with the discussion told me, and he wanted the White House to know that there were moderates there who were interested in talks. The [Bush] national-security official rejected that possibility and told the envoy, as the person familiar with the discussion recalled, "The Israelis are extremely serious about Iran and its nuclear program, and I believe that, if the United States government is unsuccessful in its diplomatic dealings with Iran, the Israelis will take it out militarily." He then told the envoy that he wanted him to convey this to his government -- that the Israelis were serious. "He was telling the Chinese leadership that they'd better warn Iran that we can't hold back Israel, and that the Iranians should look at Syria and see what's coming next if diplomacy fails," the person familiar with the discussion said. "His message was that the Syrian attack was in part aimed at Iran." In Tel Aviv, the senior Israeli official pointedly told me, "Syria still thinks Hezbollah won the war in Lebanon" -- referring to the summer, 2006, fight between Israel and the Shiite organization headed by Sheikh Hassan Nasrallah. "Nasrallah knows how much that war cost—one-third of his fighters were killed, infrastructure was bombed, and ninety-five per cent of his strategic weapons were wiped out," the Israeli official said. "But Assad has a Nasrallah complex and thinks Hezbollah won. And, 'If he did it, I can do it.' This led to an adventurous mood in Damascus. Today, they are more sober." That notion was echoed by the ambassador of an Israeli ally who is posted in Tel Aviv. "The truth is not important," the ambassador told me. "Israel was able to restore its credibility as a deterrent. That is the whole thing. No one will know what the real story is." That's what real reporting looks like. As always, it's striking how completely it's missing from the vast majority of American media accounts on this matter, which do almost nothing other than uncritically repeat Government claims.